As the name Bed & Breakfast suggest intimacy and coziness, this gas fireplace embodies these very ideals. The Bed & Breakfast is designed for corner or limited space installations in small, intimate settings such as bedrooms, baths and kitchens. 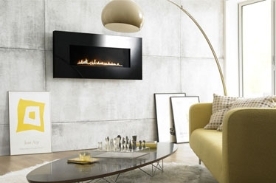 Features: Unique Portrait vertical fireplace, Generous vertical ceramic glass panel for fire viewing, Designed for installations that require a small footprint, Thermostatically controlled fan standard, Comes standard with black liner or choose the optional cast Shell Niche Liner. FOUR Arched Face Options: 24 Karat Gold, Nickel Plated, Metallic Black or French Country Antique Gold. Notice the full glass display from top to bottom and side to side. No metal box! Town & Country is the only design-driven luxury gas fireplaces with interchangeable fires and panels. 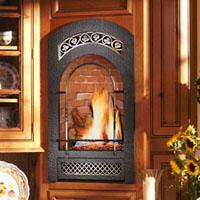 Mix or match burners and panels to achieve your style. 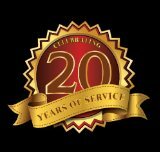 Truly Traditional, Neo Classical, Ultra Modern, all available through Design-A-Fire. 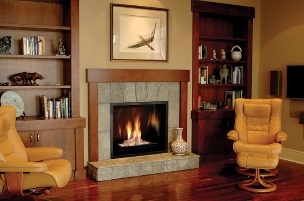 With robust full-round logs, classic split wood, smooth river rock or tumbled glass, Design-A-Fire creates the opportunity to customize the inside of your fireplace to suit the style of any room. AVAILABLE SIZES: 30", 36", 36" Arched, 36" See Thru, 42", 54", 38" Wide Screen, 54" Wide Screen. Come by the store or call 281-316-9077 to speak to one of our Staff Members for more details on these and other custom fireplaces that are available but not shown. Representing a new frontier in luxurious style and efficiency, the X-FIRES gas fireplace combines the inherent beauty of natural stone with the wonder of fire. The gorgeous aura begins with a distinctive and eye-catching surround available in a natural granite or limestone finish. 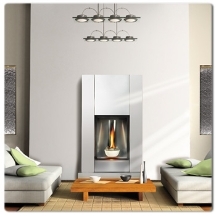 Inside, RefleXion technology creates an infinity flame effect of multiple fire levels that is truly mesmerizing. Plus, the lightweight design can be hung on any wall, while the vent-free catalytic converter technology cleans hot air as it leaves the combustion chamber-allowing installation to go where venting cannot. In the living room or beyond, this modern delight will captivate and entertain. Tureen Direct Vent FIreplace: Up to 26,000 BTUS', 50% flame/heat adjustment for maximum comfort, The remarkable towering flame is created by the Tureen's unique heavy gauge Medallion burner system, Double fired ceramic bowl with high temperature resistant refractory river rocks, Concave polished satin chrome reflective panel, Heat resistant high temperature ceramic glass door, No electricity required to light or operate - millivolt system ensures reliable use even during power failures, 100% SAFE GUARD gas control system automatically and quickly shuts off the gas supply for your peace of mind, Zero clearance to combustibles, Controls are hidden from view but easily accessible, Exclusive night light, Convenient hand-held temperature and night light, Available as a Natural gas or Propane unit.